It works for Windows NT/2000/2003/XP/vista/7 computers. 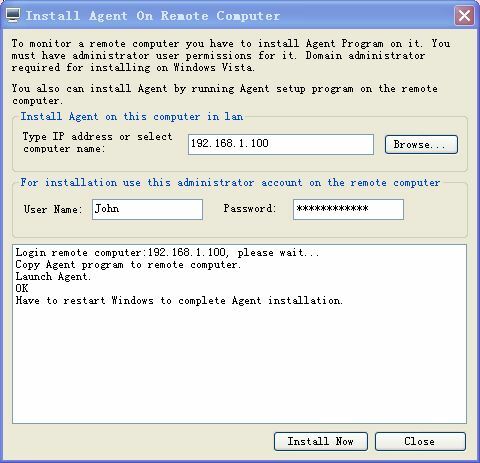 Here are the steps you need to follow to install the Agent remotely. 2. Choose a computer from computer list . 3. Click Agent Management -> Agent Management -> Install Agent, a window will appear. 4. Enter user name and password of the selected remote computer, the user must be a member of administrators group of the remote computer. 5. Click "install now", when the installation was finished, IMonitor EAM will pop up a message box to tell you. NOTE: When remote installation was finished, IMonitor EAM agent program will start after 1 minute, please click Agent Management -> Refresh Agent List to refresh agent information. If remote installation fails, you have to get access to the computer you want to monitor to install it. 1. You can find a ClientSetup.exe file in the zip file that you downloaded. 2. Go to the remote computer that you want to monitor. 3. Make sure, that computer is connected to network and TCP/IP protocol is installed properly. 4. Transfer "ClientSetup.exe" to the computer you want to monitor and run it. 5. Read the license agreement. If you accept the terms of agreement, click "I accept the agreement". 6. Type server computer's IP address, server computer is the computer that IMonitor EAM server program is running. 7. Install the client program and wait until program files will be copied. NOTE: When the installation was finished, please click Agent Management -> Refresh Agent List to update computer list.